The canvas began to take on a life of its own as the characters developed more muscle, color, clothing and personality. The landscape is richer; the snowy mountain has more "land". And, Big Sky lives up to its name. Eric spent the month buried in his work, our rapid back and forth faxes began to trickle. I had to make an emergency trip to Texas, out of fax range (the only way Eric and I can communicate is via fax). When I returned to Colorado, I found several packages from Eric that included photos (some of which you see on this website). The previous month Eric gave me the opportunity to play �art critic.� My first inclination was not to offer any suggestions to this painting � I mean; I�m not an artist. Still, I took my first impressions and/or questions and wrote them down for Eric to muse over. When I looked at Sacajewea (see photos in April) I kept asking myself, �what is she doing, why is she waving?� Eric told me it was an Indian sign for excitement, but it just didn�t seem to convey that impression to me. It appeared that she was just waving. Eric made the changes as seen in these series of photos. Another minor change that Eric made was with Drouillard, the blonde man on the right whose head was tilted to the right. He is now walking forward, looking straight ahead (click here for before and after photos). As you compare the photos between April and May, the changes are easily visible throughout the canvas. Two Shoshone warriors have been added to the left of Sacajewea. They are beside the white horse; one is crouched, the other is standing behind him holding a shield. If you look carefully, you'll see a line of mounted warriors making their way down the hillside toward the meeting. (click here for before and after photos) Texture, colors are brighter. 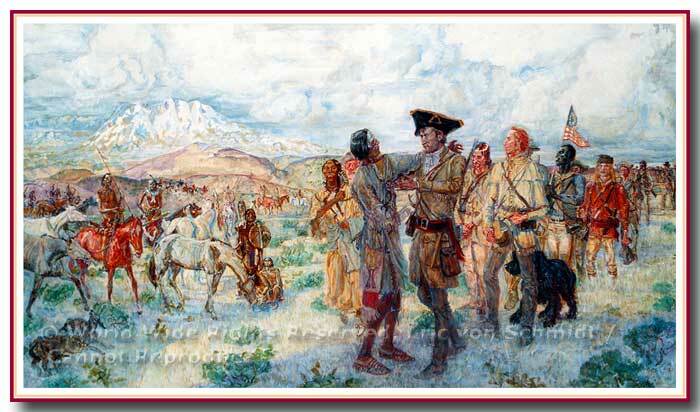 It�s great to watch �The Ballad of Lewis & Clark� come to life and evolve before our very eyes.